Having been born in West Germany, brought up in East Germany and witnessed the reunification of her country, German Chancellor Angela Merkel is now presiding over the biggest show of disunity for decades with two-thirds of her citizens opposing a fourth term for her. Merkel was born in 1954 in Hamburg — then in West Germany — but the family soon moved to East Germany, where her father — who had converted to Lutheranism — had been appointed as pastor pastorate at the church in Quitzow, near Perleberg in Brandenburg. After Germany was reunified, in 1990, Merkel won her seat at the Bundestag and was almost immediately appointed to serve as Minister for Women and Youth under Chancellor Helmut Kohl. On reunification, the Westmark replaced the Ostmark on a mark-for-mark basis and the West subsidized the East for many years — costing Berlin up to US$169 billion each year at one point. Angela Merkel (L), then German opposition party leader (of the Conservative Christian Democratic Union), addresses reporters 26 April, 2001. The reunification of Germany and the economic burdens it brought goes deep inside Merkel's psyche. Nine years after she took her seat in the Bundestag, Germany disposed of the beloved Deutsche Mark and joined the Euro as one of the original — and leading — Eurozone members. A united Germany became part of a united Euro. Now, however, the fairytale is turning into a nightmare. The Eurozone is in crisis, with deep divisions over the Greek bailout and questions being asked about the sustainability of a single currency without further fiscal union. 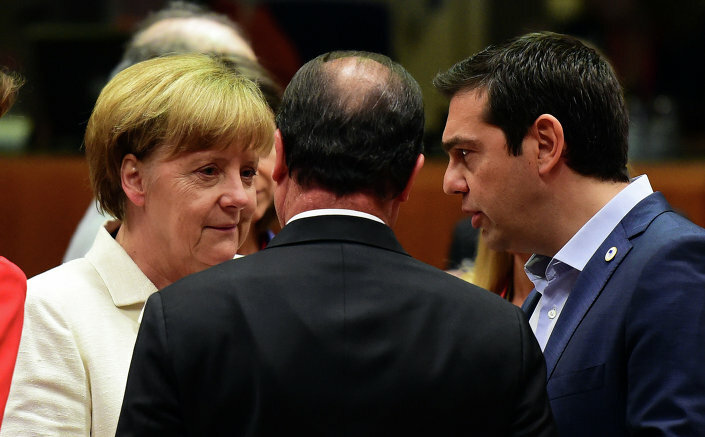 (From L) German Chancellor Angela Merkel, French President Francois Hollande, and Greek Prime Minister Alexis Tsipras confer prior to the start of a summit of Eurozone heads of state in Brussels on July 12, 2015. That, in turn, suggests a two-tier EU is possible, with even France's President Hollande calling for a Eurozone government with its own parliament. The migrant crisis — precipitated by her 'open door' policy — has shattered the Schengen zone and led to borders being erected. The thought of walls between nations will bring back chilling memories for Merkel. 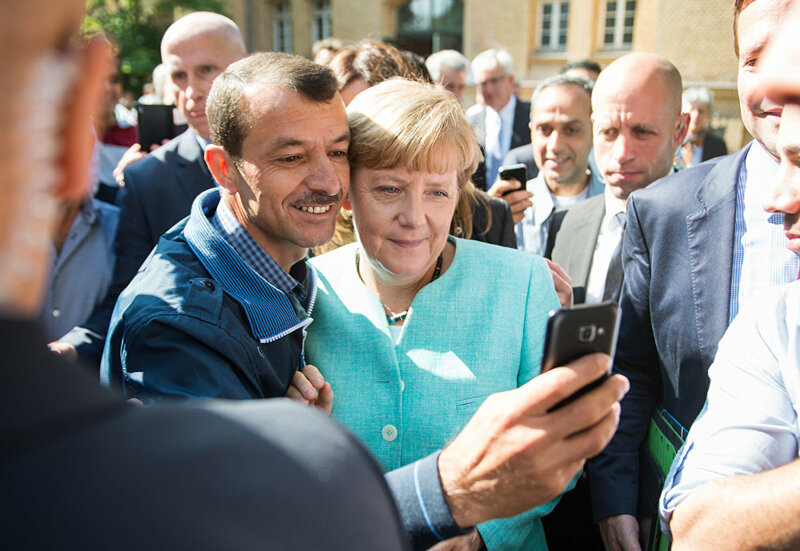 Asylum seeker (C, L) takes a selfie picture with German Chancellor Angela Merkel (C, R) following Merkel's visit at a branch of the Federal Office for Migration and Refugees and a camp for asylum-seekers in Berlin on September 10, 2015. Moreover, the deal brokered between the EU and Turkey on the relocation of migrant — largely brokered by Merkel herself — is crumbling and facing enormous criticism and calls for it to be scrapped, or at least delayed. Bavarian Prime Minister and head of the Christian Social Union (CSU) Horst Seehofer welcomes German Chancellor Angela Merkel to the Christian Social Union (CSU) party congress in Munich, Germany in this November 20, 2015. She is now facing the biggest rift between her CDU party and its sister Bavarian CSU party since its foundation following the Second World War, with the CSU leader Horst Seehofer threatening to stand against Merkel in the 2017 federal elections in which a poll by German magazine Cicero shows that two-thirds of Germans do not want to back Merkel or her party. German Chancellor Angela Merkel gives a press conference after visiting Nizip refugee camp on the Turkish-Syrian border, in Gaziantep on April 23, 2016. At the age of 61, Merkel has witnessed divisions and hardship as a child, reunification as an adult, and a united Europe as a leader. She is now staring in the face of division within her Union party, splits in the Eurozone, border disputes over migrants and the possible end to her leadership next year.